Introduced in late 2011, the 18-Mpix Canon EOS-1D X was the first full-frame model from the firm aimed at sports and press photographers as was a direct replacement the 16-Mpix APS-H format EOS-1D Mk IV. Although maintaining the familiar design and control placement with a few exceptions the new model is extremely quick, with continuous shooting at up to 12 fps and with a completely new AF system – built from the ground up. Canon are remarkably candid about the AF system – it’s a more powerful version of that found in the Canon EOS 5D Mk III – boasting a dedicated Digic 4 processor and linking to the RGB AE sensor in the viewfinder to provide additional subject tracking. The Nikon D4s is almost as quick shooting at up to 11 fps with a huge buffer for high-quality transmission ready Jpegs, much like its opponent. In contrast, while AF system has a new group-focusing mode, allowing more control over the size of the AF area the 51-point MultiCAM 3500FX module is the same as that found on its predecessor the Nikon D3s. 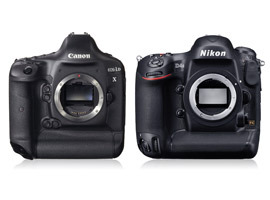 Still the D4s can put up more of fight with the new, faster Expeed 4 processor over the older tech Expeed 3 of the D4. It’s already responsible for the faster maximum burst rate (up from 10fps on the D4), and is the reason behind the new higher ISO 409,600 extended sensitivity, improved battery life and 1080 50/60p video with simultaneous recording to the internal card and an external recorder via HDMI. Not that video capture is likely to be allowed at the games by the photographers – more useful for them will be the improved AF lock on abilities of the D4s and reduced viewfinder blackout. As many as 11 cross-type AF sensors are compatible when using lenses and teleconverters with an f8 effective maximum aperture, which is better than the Canon’s capabilities (it has a single center cross-type sensor that’s compatible with f8), but anything longer than a 600mm lens at the side of the pitch is likely to be too narrow. 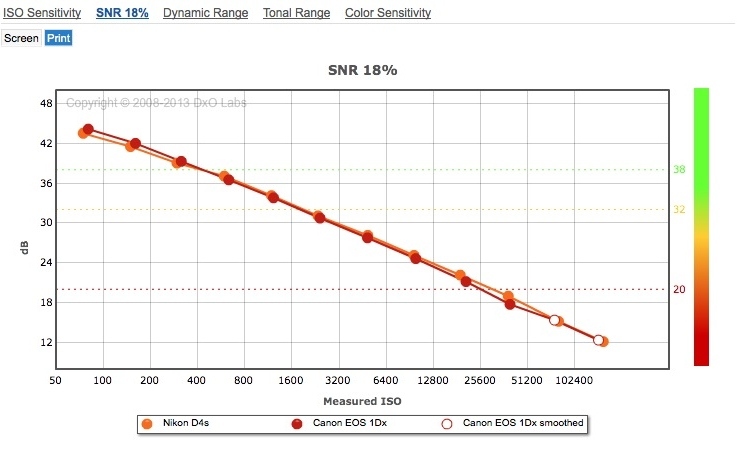 The Canon models never really test well against the Nikons, and with the EOS 1-D X trailing by 7 points in our DxOMark sensor analysis it is slightly outshone by the newer Nikon D4S. In terms of raw data output the Nikon has the advantage in color depth with around +1/3 stop advantage at base and indeed throughout the ISO range over the Canon. The Nikon D4s has better color discrimination to the Canon EOS-1DX and that’s not just at base but also at every ISO setting. 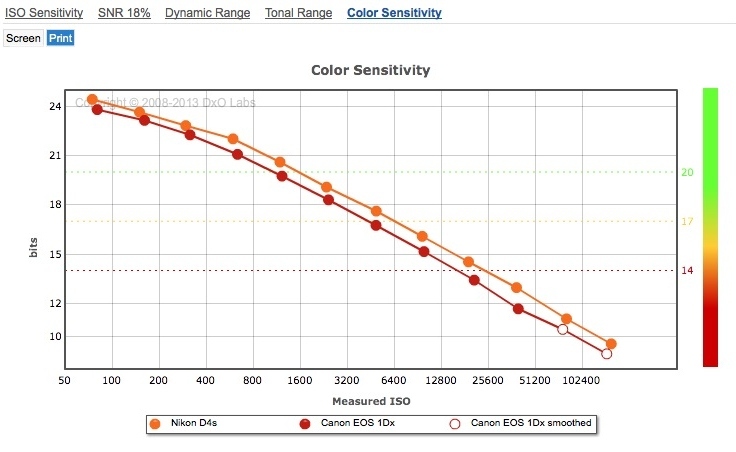 As for the much-vaunted dynamic range the Nikon D4s has an extra 1.5 stops at base over the Canon EOS-1D X but that advantage is eroded at higher ISOs and there’s nothing in it by ISO 1600. On the face of it, it looks as if the Nikon has a significant advantage but remember this is based on raw data – out of camera Jpegs aren’t assessed in our tests. 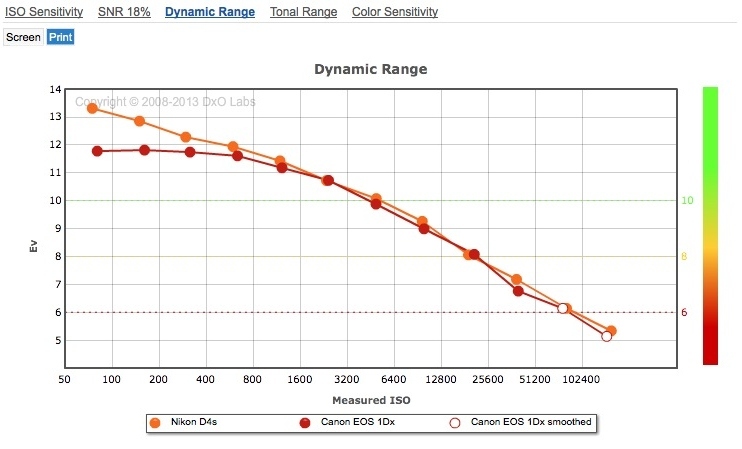 The Nikon D4S sensor may have a wider dynamic range and better color discrimination than the Canon EOS-1D X but the gulf between the two sensors is less than you might think, and that’s certainly the case with noise levels. Infact the Canon has lower noise at base than the Nikon when measured at 18% grey and however the D4s can outdo the Canon in our Sports category (shown above) as that’s based on acheivng an excellent SNR value (30dB) while maintaining a dynamic range of at least 9 Evs and a color depth of 18-bits – where Canon can’t quite match the Nikon without using a slightly lower ISO. The upshot is the Nikon has better low-light performance overall, but even then it’s realy only a slight advantage when using raw, and may not be visble at all with out-of-camera Jpegs. Although noise levels are similar, the Nikon’s wider dynamic range and higher color depth means that it has a slight advantage in low-light capability. 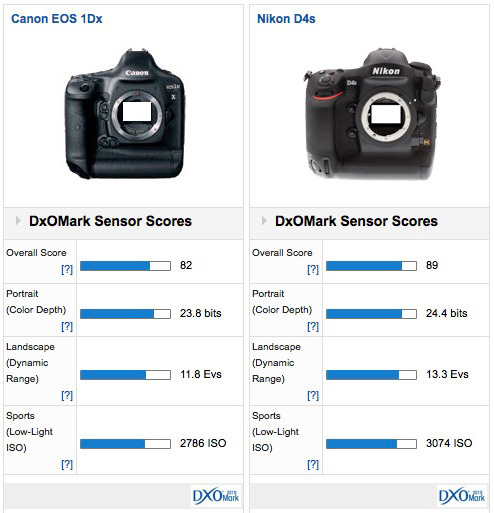 Just like football, the scores are final on the day and in that respect the results of the sensor analysis means the Nikon D4s is ahead of the Canon EOS 1D X, but in reality the two are closely matched and that applies as much to the technical spec’ as anything else. When there are no second chances professionals rely on these cameras to perform faultlessly and while both models are compelling for that reason, in the right hands both cameras produce results that would be difficult to tell apart.